Following up from Road fatalities in the UK this post looks at fatality rates going back to the 1920s. Reading a book – the History of Time trialling by Peter Whitfield I was struck by some statistics about the level of road fatalities, during the 1930s and 1940s. Despite road traffic being only 10% of today’s levels. Road deaths reached nearly 10,000 a year. There were up to 1,000 road fatalities a year of children under 10. Blackout during the second world war – cars not allowed to use headlights. In September 1939, there were 1,130 deaths in that month alone, 148 who were cyclists. This was not helped by court judgements during the second world war, which stated if cyclists were hit during a blackout, there were responsible because they failed to look behind them! No driving test. The driving test was only introduced in 1935, but even then – if you were already driving you didn’t have to take a test. Very few road markings. No white lines, or cateyes. No real attempt to do anything about it. There were more pressing concerns like Mr Hitler across the channel. Motorists were very rarely held accountable. In rare cases which did come to court, judges would often dismiss the challenge. The court often asked the motorist if they beeped their horn. If they beeped the horn then all the blame must be on pedestrian / cyclist for failing to get out of the way. There was a strong feeling that roads were for cars, and other road users were just a nuisance. In 1924 the Metropolitan Police Commissioner advised cyclists to avoid London, on the grounds that 150 cyclists were killed cycling in London every year. There was no attempt to make driving safer or look at infrastructure to help cyclists. The simplest solution was just to discourage cycling. Is it any wonder, cycling in London fell so dramatically? Nearly 100 years later, we’re still trying to change this deeply engrained view that it would ‘all be easier without cyclists on the road’. 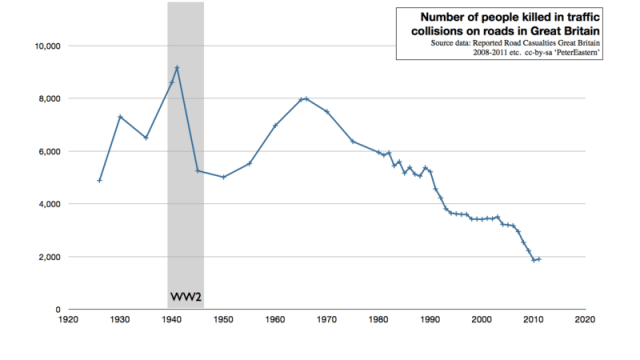 Road deaths fell from the 1930s, but it was also at the cost of making many roads – virtual no go areas for pedestrians and cyclists. In the 1930s, it would have been common for children to play in the road, cycle to school. That is rare now. Blame was rarely apportioned. It’s a strange human psychology. But, if people die in a train accident or plane accident, someone is blamed and we are not satisfied until stringent steps have been taken to make train travel, aeroplane travel safer. However, when there is a fatality on the road, we tend to just shrug our shoulders and say it is an accident. If a train crash is caused by excess speed, you can guarantee the next day, speed limits are in place. If there is a fatality on the roads due to excess speed, you can guarantee the next day, nothing will have changed. 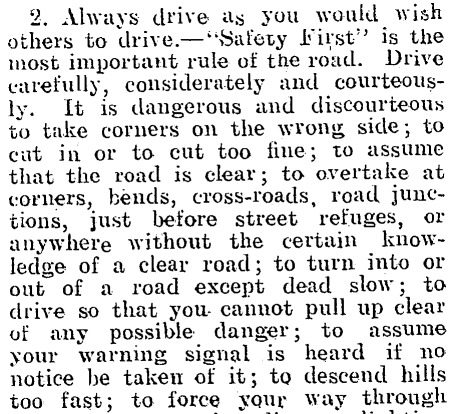 These were extreme attitudes of laissez faire to road safety. Things have changed for the better. The number of road deaths has steadily fallen – whilst the number of cars on the roads increase. But, road fatalities are still one of biggest causes of deaths of young people. In 100 years time, it is quite likely we will look back and say ‘Why did we tolerate 2,000 deaths a year on the road’ ? – Why did we tolerate so much excess speed and dangerous driving in city centres?